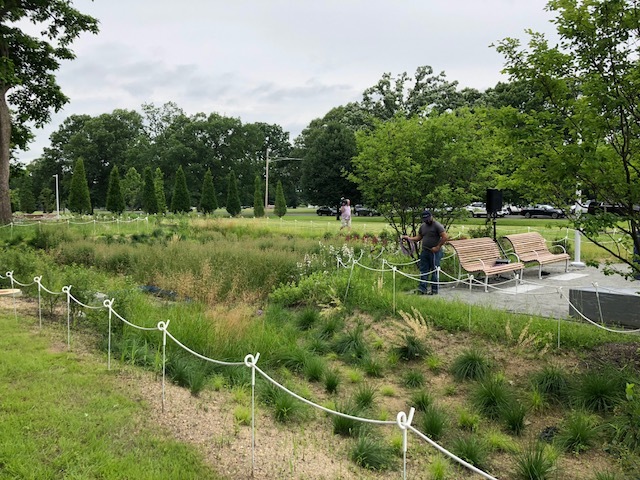 Last week Philadelphia’s park system celebrated the openings of two beautiful new parks that have been years in the making: West Fairmount Park’s Centennial Commons and the Rail Park. In the Centennial Commons, rain gardens, benches, and swings are arranged to create “front porches” that face Parkside Avenue’s historic homes, while the Rail Park’s swings and decks offer new views of the city along an elevated quarter-mile stretch of formerly abandoned railway, beginning at 11th & Noble Streets. Both parks were made possible by partnerships between the City of Philadelphia’s Department of Parks & Recreation and local non-profits (Fairmount Park Conservancy and Parkside Centennial CDC, for Centennial Commons; Center City District and Friends of the Rail Park, for the Rail Park). In addition, both projects are part of the Reimagining the Civic Commons network, which brings together public space and community-based organizations across five sites in Philadelphia, and also connects them to colleagues doing similar work in Akron, Chicago, Detroit, and Memphis, with support from the Knight, Kresge, JBP, and Rockefeller Foundations. Most importantly, both ribbon cuttings mark beginnings, not ends; the work of ensuring that these spaces will meet their intended goals of welcoming nearby residents as well as visitors lies ahead. How public spaces impact visitors, neighbors, and neighborhoods, and how spaces are maintained, managed, and programmed in the long run deserve as much attention as initial design and construction. As parks that will attract visitors from across the city and which are located adjacent to communities of color as well as to lower income residents, both Centennial Commons and the Rail Park must strike a balance between serving the city at large while remaining both “of” and “for” their immediate neighbors in East Parkside and Chinatown. This is a tall order, particularly in the context of changing neighborhoods, but one to which park stewards – especially local community-based organizations – are committed. How public spaces impact visitors, neighbors, and neighborhoods, and how spaces are maintained in the long run deserve as much attention as initial design and construction. It’s fitting that these ribbon cuttings coincide with another Philadelphia public space milestone: the release of a new report on “civic infrastructure” by PennPraxis with funding from the Foundation. Authors Liz Greenspan and Randy Mason note that “a public space project is never ‘simply’ a public space project […] it always intersects with a range of social, economic, and historical factors, all of which inform decisions about investment, design, and programming.” The report explores how public space projects around the country are grappling with these factors, and advocates for a more holistic, systems-oriented approach to this work. By embracing a holistic approach to public space funding, we at the Foundation ultimately hope to ensure that every neighborhood has access to beautiful, well-maintained, locally-valued public spaces. Our funding guidelines prioritize factors that we believe are essential to achieving this goal, such as respect for resident knowledge and expertise, recognition of local community history and context, and emphasis on social, economic, and racial inclusivity (e.g., multi-lingual communication or locally-relevant cultural programming). This type of work will take place long after the ribbon cuttings, and is central to ensuring that Philadelphia’s public spaces can live up to the needs and interests of all of its residents.